As different cloud tools, from storage services such as Google Drive to CRM systems like Salesforce grow in popularity, so do the security risks – especially as these tools are often used by employees without the consent or even knowledge of the head of the business. With employees sharing sensitive company and customer data and documents on cloud-based platforms, how do you ensure that your data won’t fall into the wrong hands, while empowering your employees to use the latest technologies to boost productivity? 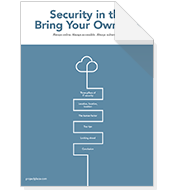 By following a few simple steps you can develop a simple but sound strategy to protect your organisation. To download whitepaper, fill in the form to the right.